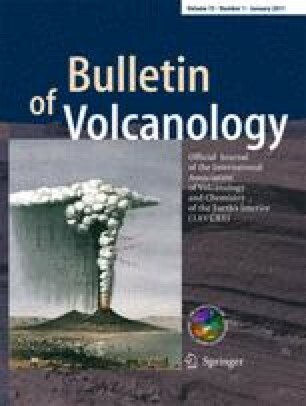 New studies of the deposits from the latest caldera-forming eruption (the “Dk” event) at Dakataua Volcano, New Britain Island, Papua New Guinea, help identify an intense space-time concentration of large-scale volcanism during the 7th century AD on New Britain. Radiocarbon dating of charcoal from the Dk deposits yields an age of 1,383 ± 28 BP. Calibration of this result gives an age in the range AD 635–670 (at 1 s. d.). At about the same time, two other volcanoes on New Britain, Rabaul and Witori, also produced very large eruptions. Very high acidity levels in ice cores from Antarctica and Greenland at AD 639 and AD 640 respectively may be linked to either or both of the Dakataua and Rabaul eruptions. Another ice core high acidity level, at AD 692, may be associated with the Witori eruption. Significant volcanic risk within the New Britain region is indicated by its Late Cenozoic history of relatively frequent large-scale eruptions from as many as 8 caldera systems within an arc-parallel zone about 380 km long. Over the last 20 ka the return period for major (VEI 5+) eruptions in this region was about 1.0 ka and individually high frequencies of major eruptive activity were experienced at Witori and Rabaul. The relatively short return period for major eruptions in the region would tend to increase the chance that such events could cluster in time. This research has been funded by grants from the Australian Research Council and the Pacific Biological Foundation. The authors are very grateful to R. W. Johnson, formerly of Geoscience Australia, and to H. L. Davies of the Geology Department, University of Papua New Guinea, for stimulating and helpful reviews of earlier versions of the manuscript. H. Patia of Rabaul Volcano Observatory assisted with processing and presentation of petrological data. M. Sari of the Port Moresby Geophysical Observatory assisted with word processing of the manuscript. S. Taguse of Mineral Resources Authority, PNG, prepared the line diagrams, G. Wallace prepared Fig. 6, and T. O’Neill and M. Hubbard prepared the stratigraphic columns. C. O. M. publishes with the permission of the Secretary, Department of Mineral Policy and Geohazards Management, Papua New Guinea.